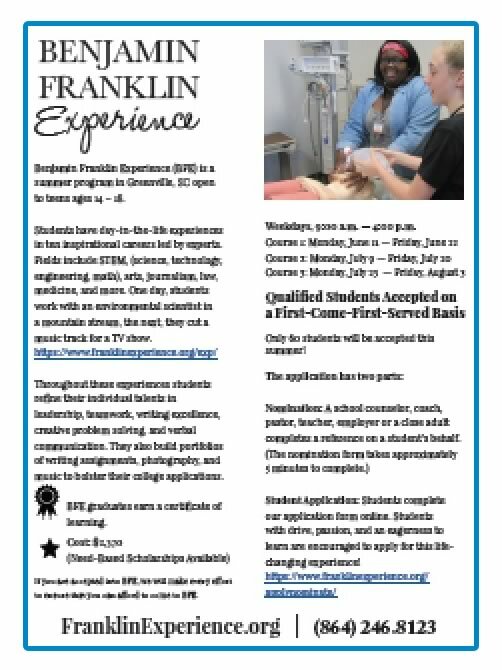 Benjamin Franklin Experience (BFE) is a summer program in Greenville, SC open to teens ages 14 – 18. Students have day-in-the-life experiences in ten inspirational careers led by experts. Fields include STEM, (science, technology, engineering, math), arts, journalism, law, medicine, and more. One day, students work with an environmental scientist in a mountain stream, the next, they cut a music track for a TV show. 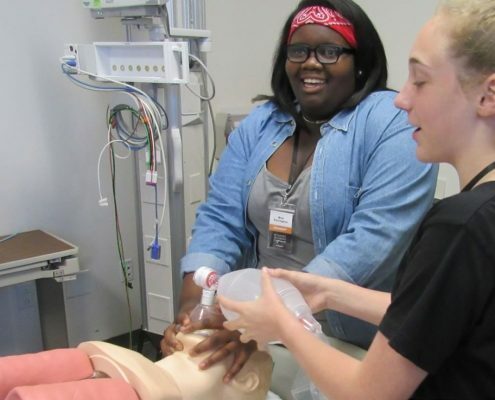 Throughout these experiences students refine their individual talents in leadership, teamwork, writing excellence, creative problem solving, and verbal communication. They also build portfolios of writing assignments, photography, and music to bolster their college applications. BFE graduates earn a certificate of learning. Only 60 students will be accepted this summer! Student Application: Students complete our application form online. Students with drive, passion, and an eagerness to learn are encouraged to apply for this life-changing experience!